Every year since 1950, the National Coffee Association conducts a survey of past-day coffee consumption. The report reveals trends in tea consumption and suggests opportunities for distinctive flavors, premium offerings, and daily shifts in consumption behaviors. Coffee consumption is up- 64% of respondents drank coffee the previous day. More than half of this coffee is gourmet, and less than a third falls in the “traditional brewed” category. There was also a slight (4%) drop in away-from-home coffee consumption. Overall tea consumption dipped 2% from the previous year, with black tea also declining 2% compared to 2017 numbers. Green tea consumption dropped below numbers for the previous 2 years. 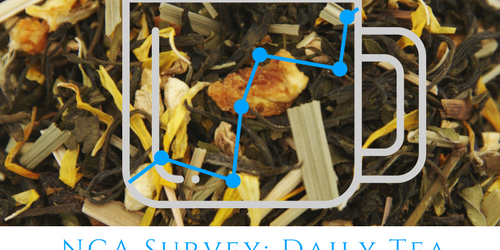 The survey also tracked time of day when teas are more and less likely to be consumed. The biggest upward swing occurred from lunch to dinner. You can find more information from World Tea News Article, and the National Coffee Association’s Report and News Release. What’s Going On With Tea? 1. Are offerings keeping pace with expectations? The Tea Association of the USA’s numbers also point to black tea being predominantly black and iced, but trends in tea my also be shifting away from the NCA’s bucket of “regular” black tea offered in a traditional teabag. Starbucks, Dunkin, and other major coffee bars are upping the ante with more premium teas beyond the traditional chambered teabag. 2. What are the better space(s) for innovation and improvement? While it is true that green, oolong, herbal, and other tea types have long represented a smaller share of the pie, there is still room for growth. Matcha and matcha latte are examples of green tea beverages experiencing increased popularity, especially when combined with other flavors and functional/flavorful ingredients. New herbal ingredients, like blue butterfly, open the door to new possibilities in a colorful spectrum of teas. 3. What are the peak times to serve teas? The NCA survey also reveals the importance of timing in serving and selling teas. Lunch time seems to mark the high tide in daily tea consumption, with the swell gradually receding in early-to-mid evening. 4. Who is more likely to drink teas? The NCA and Tea USA data seem to agree- younger people are as likely (if not more likely) to drink tea over coffee. The Tea Association of the USA puts the number at 87% of Millennials drink tea.